Joggins is a tiny village, made famous for its amazing cliffs stuffed full of fossils. It’s hard to imagine the weathered cliffs of Joggins, set on the Bay of Fundy shoreline, as a lush tropical forest but 300 million years ago it was exactly that. In 1851, fossilized tree trunks in their original positions were discovered. On closer examination, tiny bones found inside the trunks turned out to be the remains of the world’s first reptiles. Today, the fossil cliffs of Joggins – some 15 kilometers long – have some of the best preserved fossils in the world and they’re a UNESCO World Heritage site. You can spot the remains of giant trees, insects and even the ancestors of the dinosaurs just by walking along the beach and looking up at the cliffs. It’s also possible and worthwhile to take a guided tour. 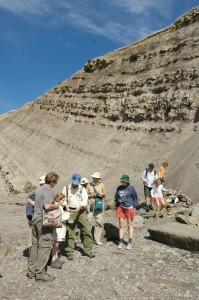 The new Joggins Fossil Centre explains all about the cliffs and arranges walking tours. You don’t have to pay up for a guided visit. Just walking along the beach is free. Remember to time your visit for low tide, when the Bay of Fundy recedes dramatically to expose the shoreline. Directions: Joggins is on Route 242. From Highway 104, take Exit 4 at Amherst, then Route 302 towards River Hebert and Joggins. By car, it takes 30 minutes to reach Joggins from Amherst and 2-3 hours from Halifax. With 2 days to spare, take the longer scenic route by following the coastline along the Bay of Fundy. Take Route 2 from Truro towards Five Islands, Parrsboro and Advocate Harbour before turning north to Joggins. Opening times: The fossil centre is open May to November, 9:30am to 5:30pm. The rest of the year it opens by appointment only.